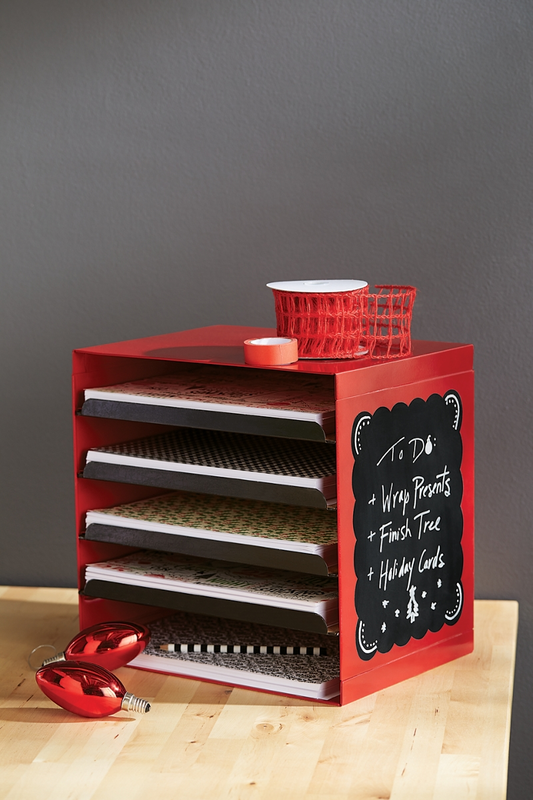 Jazz up a simple paper rack with Krylon® Spray Paint. Assemble storage unit according to manufacturer’s instructions. With trays removed; spray paint all areas of rack with ColorMaster™ Cherry Red; allow to dry completely. With personal die-cut machine and adhesive backed vinyl, cut two scalloped rectangle stencils to fit sides of rack. Adhere stencils to sides of rack. Mask off all other areas with paper and tape. Spray stenciled areas with Chalkboard Paint; allow to dry completely. Mask cork areas of trays with masking paper and tape. Spray tray fronts with Chalkboard Paint; allow to dry completely. Condition dried chalk paint according to manufacturer’s instructions.